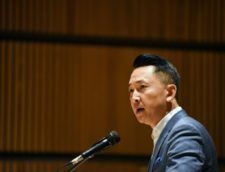 Fareah Fysudeen reports on Viet Thanh Nguyen’s reading and discussion of his books at the University of Michigan in this article for [art]seen. 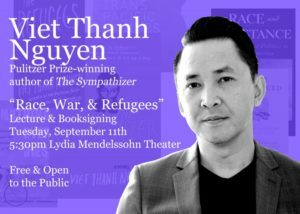 Viet Thanh Nguyen received critical acclaim for his book The Sympathizer, earning a Pulitzer Prize in 2016 and a string of other awards and recognitions. It was to the utmost excitement of the University to host him with the collaboration of over a dozen student organizations and departments on campus. The reading and lecture was introduced by the well-loved and exuberant Emily Lawsin, Professor of Women’s Studies and American Culture, who declared his novel as a major work of representation for Vietnamese Americans, and the Vietnamese Student Association; both welcomed Nguyen to the stage with raucous applause. There is much to be said about both the reading and lecture, though I will focus on the reading in this review. Nguyen’s reading was moving in an unexpected, visceral kind of way. 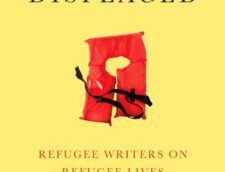 Framed by the lecture’s air of social justice and interwoven with his own personal accounts of being a refugee in America after the Vietnam war, the reading was elevated in its state of importance in the packed theatre. The book follows the circumstances of a nameless narrator moving from the final days of Vietnam to his shift to Southern California. The narrator is a double-agent, spying on Southern Vietnamese forces until he is forced to the US. Nguyen’s writing is witty, funny, takes the often mundane or silly and complexifies it into something rich and important. There was a passage that he read on the stench of Vietnamese fish sauce, which could not have been more eloquent and hilarious: “This pungent liquid condiment of the darkest sepia hue was much denigrated by foreigners for its supposedly horrendous reek, lending new meaning to the phrase ‘there’s something fishy around here,’ for we were the fishy ones.” He tackles Vietnamese identity with the depth of someone who is acutely aware of all facets of his American experience– from the microaggressive comments from white people to the guilt of being a half-refugee, half-American and having to choose one to the strange, wacky clashes in culture and tradition. Most critically acclaimed stories on the Vietnam War are often from the American perspective, like The Things They Carried or Matterhorn. They all focus on how the war affected America and wounded its soldiers– it’s the same sentiment of how Americans start wars and then make a movie thirty years later on its damaging consequences on its poor citizens. And I don’t mean to diminish the trauma of the war on Americans– it’s just that when you think about it from a bigger perspective, it’s a bit selfish to see only that. We’d left a country with hundreds of thousands of orphaned children, over a million refugees, and a simmering hatred between North and South Vietnam that still lasts today. At least our stories must reflect both sides. At least our stories, if anything, must do the invisible job of reconstructing our wars so we remember them through a lens of truth, justice, and of honesty that couldn’t be served before those stories were made. 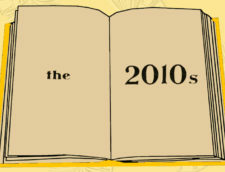 The Sympathizer ranks among those stories, and Viet Thanh Nguyen among its brilliant tellers.